So, let’s say you played the Mirror’s Edge demo and liked it, but you haven’t bought the full game yet because you’re completely and totally broke (me). Maybe you’re sad because you don’t have it, maybe you’re angry at the world. Well, do I have a solution for you! I mean, it’s not my solution, really, since I didn’t make it, but whatever, that’s not important. 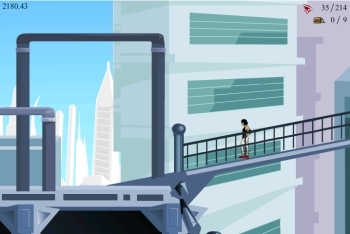 What is important is that you can now play the free flash 2D version of Mirror’s Edge here. Brad Borne (I think he’s from those The Borne Something Something movies, he also is the creator of Fancy Pants) and Electronic Arts have partnered up to create the game, which is actually very fun and the music is great. This is only the beta version of the game, the full version should be complete in one to two weeks. I played this and I enjoyed it. It was frustrating at times though. Also playing it in class did not allow me to listen to the soundtrack, maybe that would have enhanced my enjoyment. I thought the characters moves were very smooth and fluent, just like when Mike strokes the strings on a guitar on wii music. GET INTO IT.